Smallholders, the pets and garden centre of 113-117, Woodgrange Road, has had a brief reprieve from its impending closure. Earlier this summer, Kevin Shaw, the shop's proprietor, was given three months notice to quit the premises, as his lease was nearing its end. Kevin was able to amiably negotiate a year's extension from the leaseholder, and is now on the look-out for new premises, from next September. Smallholders - like Barry's, the butcher and Websters, the iron mongers - has been one of the fixtures on the Woodgrange/Woodford Road strip for decades, offering a retail plus professional advice and experience for relevant E7 and beyond shoppers. The outlet was originally established by John Frost in 1948. His family still has the freehold on the property and is looking to sell, as part of tidying up his business affairs. Originally from Ridley Road, Kevin joined John, as a 13-year old "Saturday boy" in 1985, and has been working at the shop ever since - apart from an unsuccessful five month stint, in the late 80's, as a pipefitter. Kevin took over as proprietor in 1999, and has since transformed the business. The shop's original main selling points were pets and plants, but times have changed and the business focus has changed with them. Kevin sells few live pets, these days - there isn't the demand, and only has a couple of busy times a year on the "plant" side now. 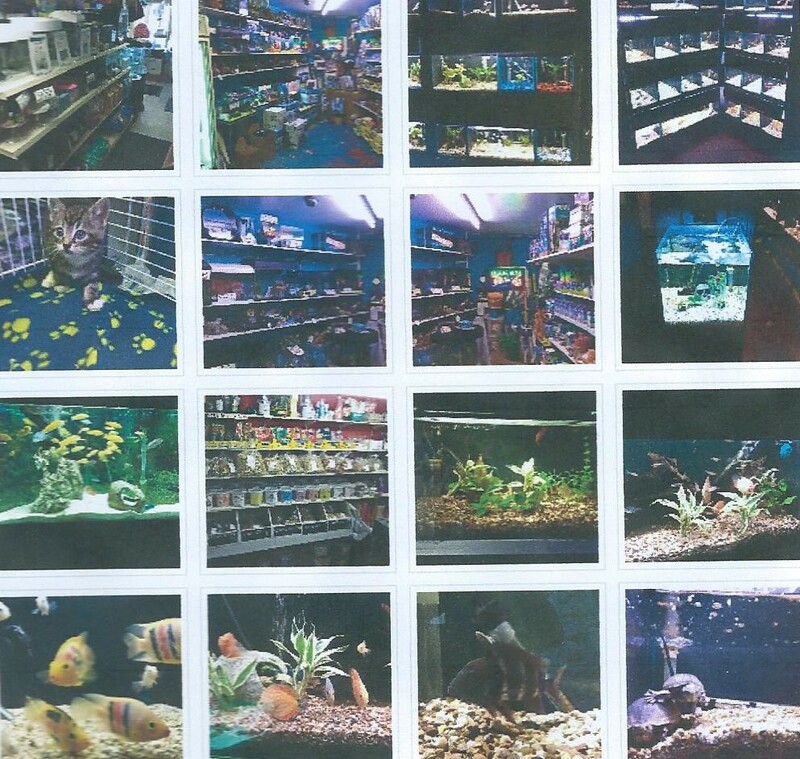 The sale of live animals is tightly controlled by legislation, and inspected regularly by local authority animal inspectors. Kevin and his shop have never had problems on this front, but he says the demand for pet animals has declined locally because of the changing demographic profile of the area, and the fact that so many Forest Gate people live in flats, these days. He has a much greater turn-over of pet food and toys than he does for animals they are aimed at. But even here, he suffers from strong competition from pet supermarkets. He makes only pennies from packages of pet food, and a ruthless accountant would advise him to discontinue the lines - as they take up too much space for too little reward. He continues with them, though, mainly as a service to long-standing customers. His plant business suffers now from competition from large garden centres, although his Christmas tree offers are good value and save a transport problems for local purchasers. The quality of his plant seedlings in the summer, provides him with a reasonable stream of business. As far as fresh flowers are concerned, he is squeezed at one end of the market by the cheap bunches from supermarkets and petrol stations and at the more exotic and high end, by florists, such as Molly and Bill's a little further along the road. Kevin's major business, these days, is in the area of exotic fish - as a visit to his website will testify. He reckons it now accounts for 70% of his turnover. A visit inside, and you'll soon find out why. It almost feels as if you have stepped into an aquarium! 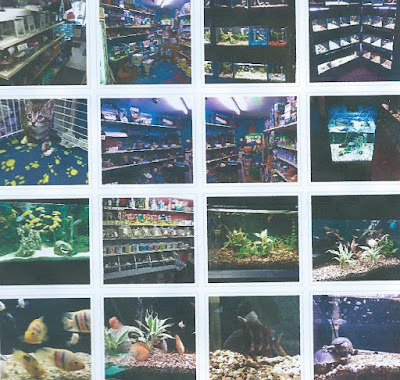 Such has been the success of the "fishy business" that Kevin has almost doubled the floor space of the shop, since he first took over, those 19 years ago, with most of the additional space occupied by tanks of exotic fish. They have become fashionable, and Kevin is able to get them from almost all over the world - on demand. Importing of fish is, of course, subject to animal welfare and health and hygiene restrictions - the fish have to go through a quarantine period having entered the UK, for example. And Kevin knows his way around these complexities. Smallholders will be homeless in a year, unless Kevin can find another shop. He admits he's been well treated by his former boss and present landlord, and is grateful for the support he has received. But rental of an equivalent space locally will cost in excess of £20k per year, before taking into account business rates, fuel bills and the other overheads. Sums like this are simply unaffordable, even without taking into consideration the limitations on trade imposed by parking restrictions on shopping streets in Newham. So - why doesn't Kevin go down the road of so many of Forest Gate's other innovative retailers - and get a railway arch? The problem, he says, would be the vibrations from the trains as they pass, they would disturb, frighten and in extreme cases, possibly kill the fish. Kevin is having to look further afield for an affordable relocation. Further into Essex is an option - as Barry the butcher tried, before returning to Forest Gate. Kevin could offer a free delivery service on appropriate orders to local customers, should he move further east. But, as Barry discovered, that can be easier said than done. Hurry down - while stocks last! If Kevin has less than a year to go, give him a good send off. A Christmas tree there, in December, perhaps? A new interest in exotic fish? Or planting out his seedlings next summer - as a fond farewell? The Plaistow Land Grabbers actions, see previous post, provided inspiration and stimulus to a local resident, William Pooley, who soon organised Hunger Marches and the "Back to the Land" movement, as a solution to unemployment in Edwardian England. 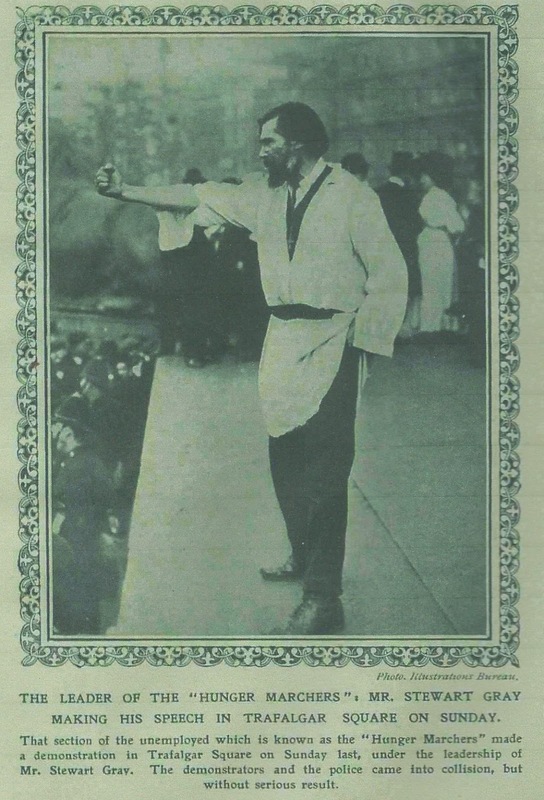 Pooley and his activities provide a colourful, if eccentric, chapter in the radical, anti-poverty politics of pre World War 1 West Ham, and the south-east more generally. They are the primary focus of this article. 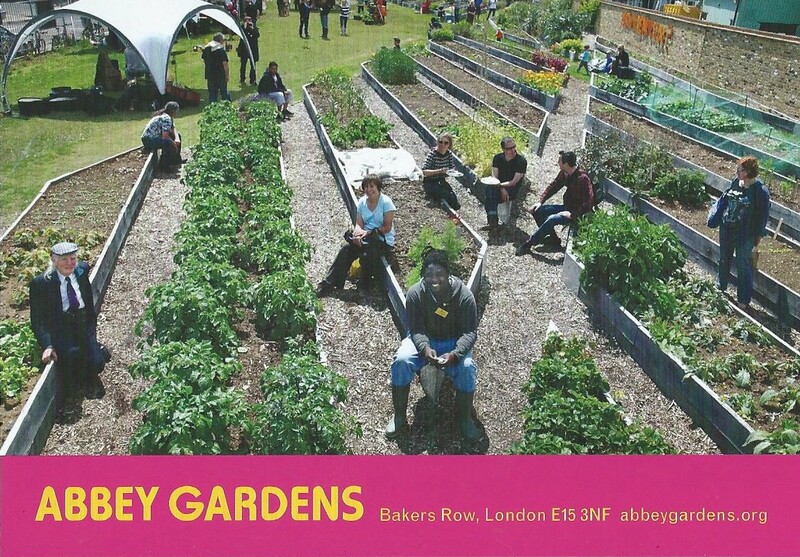 The Land Grabbers were also the inspiration to a community garden established in the south of Newham, a century after the original fizzled out. The Abbey Gardens are featured at the end of this article. Huge thanks to Dr Mark Gorman for sourcing some of the great images, here. William Pooley was a fascinating character. He was born in Castle Acre, Norfolk in May 1856, the illegitimate son of an agricultural labourer. By the age of five he was still living there with his mother and an illegitimate sibling, in the house of his grandparents. The family were all agricultural labourers. A decade later he was, himself, an ag lab, living in West Hexham, Norfolk with his mother and step-father, a shepherd. He married Catherine Gurney (no connection to the affluent Upton Gurneys), daughter of a bricklayer in Kingston, Surrey on Christmas Eve 1877, and within four years the couple were living at 39 Cypress Place, Beckton, where he was described as an "Eating House Keeper". A decade later, in 1891, he lived at 175 Queen's Road, Plaistow (subsequently built over by more modern housing) when his occupation was given as a "Temperance Drinks Manufacturer". The couple had nine children, and were at the same address in 1901. William Pooley was described as an employer, working at home with two of his sons, Herbert and William in the firm in 1901. He began to spread his business wings soon after this, however, and within four years began to display, publicly, the first signs of the showmanship that characterised the rest of his life. 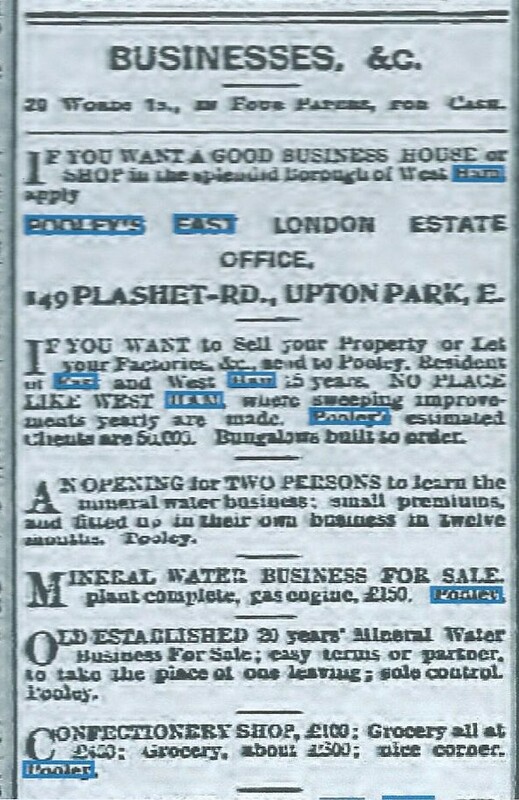 By 1905 he was advertising himself as an estate agent and auctioneer in the Essex Press, promoting "Pooley's East London Auction Repository", which was, in fact his home address. He was offering businesses for sale: confectioners, land plots in Essex, dining rooms, grocers in Leyton, a blacksmith's in Chelmsford and apparently, his own Mineral Water business (for £175). See advert, below. 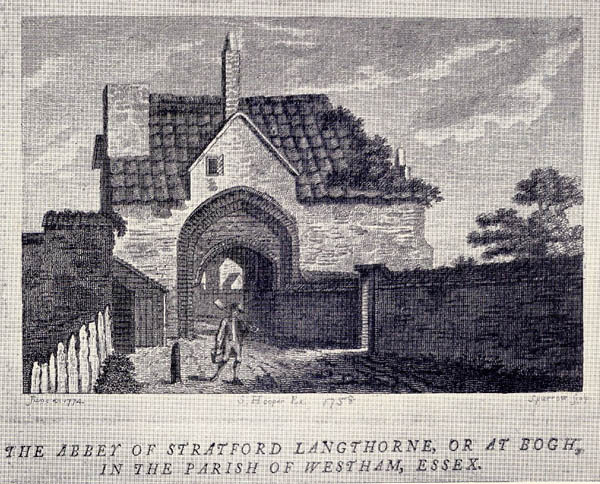 He subsequently moved just around the corner, to 149 Plashet Road, which he described as his "East London Estate Office", offering the same services - see photo of premises, today. 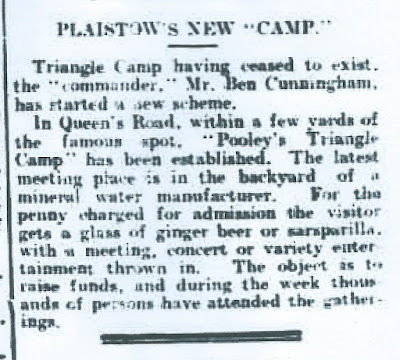 He was clearly inspired by the Triangular Camp, established by the very local Plaistow Land Grabbers - which set him off in a completely different direction, although still following his business as a soft drinks manufacturer. One press report, from the Grays and Tilbury Gazette of 25 May 1907 described him as its "the chief mover behind" the Triangular Camp. But, given his proclivity for self promotion and aggrandisement - see later - this is probably an overstatement, as he scarcely features in contemporaneous press reports of the Camp. Pooley became a flamboyant anti-unemployment campaigner in the south-east of England, and attracted not a little notoriety and scepticism for his actions and claims. Shortly after their eviction from the Triangular Camp, in late August 1906, the Land Grabbers set up another camp, just around the corner, in Pooley's yard in Queen's Road, with their “Commander” Ben Cunningham in charge. To generate funds, Pooley, charged visitors a 1d. entrance fee, for which a glass of ginger beer was served; thus combining his convictions with his business interests, as he was to do for much of the rest of his life. Concerts and talks were also on offer to visitors and campers, alike. 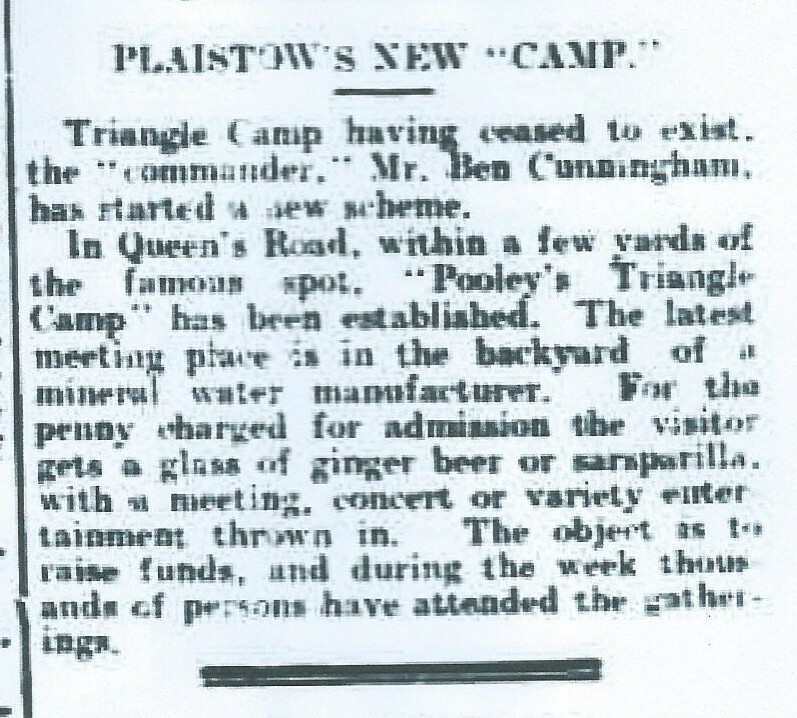 “Pooley’s Triangular Camp”, as it was called, attracted large numbers of visitors. Its fate is unclear, but it was short-lived (see press cutting, below). A new body was set up, the “Right to Live Council”, with Cunningham as its chairman. Its aims were “to bring together labourless land and workless labour” by letting small plots of land at nominal rents, and establishing workshops for unemployed workers. Anticipating “a terrible winter for the workless”, Cunningham’s committee aimed to force the state to take action. Arrangements had been made for them to stay in an empty house along the Hadleigh Road, not far from the Elms Hotel. The house is used as a wine store by Mr William Pooley, who has works at Barking etc and who has a great interest in the Barking Unemployed Fund and was the chief mover in forming the Triangular Camp in Plaistow. Mr Pooley has named the home "Paradise Gardens", although it is somewhat difficult to discern the appropriateness of the title. The last sentence is a somewhat tongue in cheek reference to Pooley's penchant for exaggerating the importance of buildings, by allocating them rather grandiose titles - as will be seen later in this article. The Gazette reported that there were about 60 people on the march and that according to Pooley: "The object is an account of the starving unemployed, who are willing to work and unable to get it. They are in terrible straits"
The intention of the march was to collect money in Southend for the hungry wives and children of the marchers. The Gazette said: "Mr Pooley added with pride he and his sons cooked a fish for each man and gave them half a pint of ginger wine." 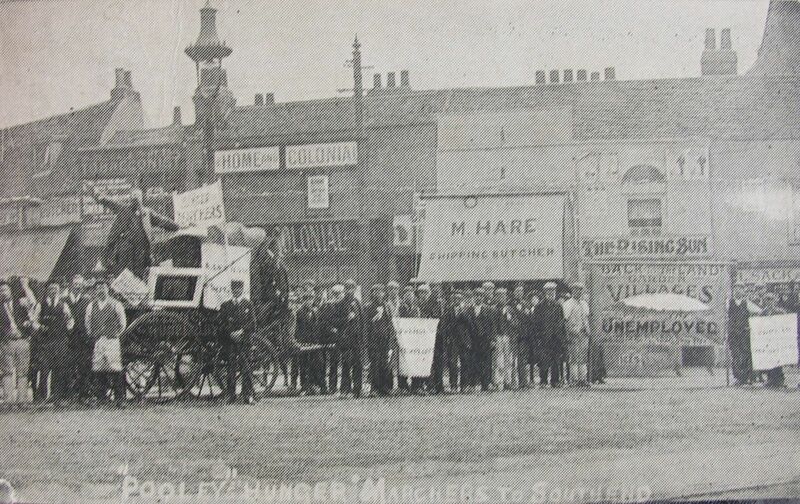 William Pooley with his "curious looking vehicle"
and hunger marchers campaigning through Essex. 'Back to the Land Movement', headquarters Pooley's Hall, Upton Park (ed: his house! ), with City Office: 22 Coleman Street EC. 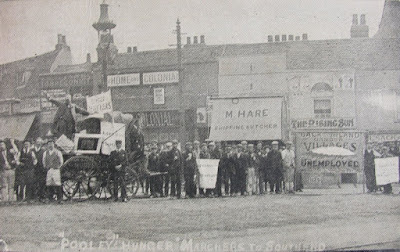 As a result of the 'Hunger March' on July 29th last (as represented from a photograph on the other side) a large number of unemployed have received permanent work on the land, Road-building, etc. Similar 'Marches' organised weekly entailing considerable expense are providing equally encouraging and successful. Subscriptions and all other practical help earnestly and urgently needed, and will be gratefully received. W Pooley - founder and organiser. Pooley and his marchers were on the road again, and in trouble with the police, the following year, when he lead a “right to live” march from Upton Park to Trafalgar Square - the demonstration was broken up with some force by the police. 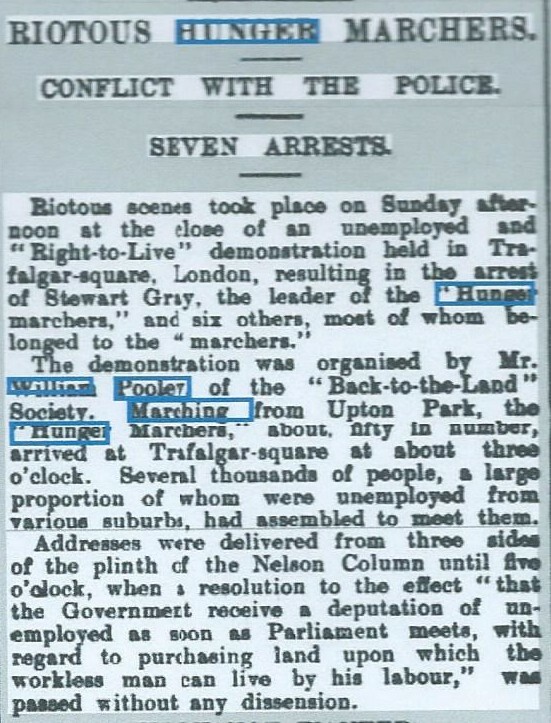 Riotous scenes took place on Sunday afternoon at the close of an unemployed and "Right-to-Live" demonstration held in Trafalgar Square, London, resulting in the arrest of Stewart Gray, the leader of the Hunger Marchers and six others, who belonged to the "marchers". The demonstration was organised by Mr William Pooley of the "Back-to-the-Land" Society. Marching from Upton Park, the "Hunger Marchers", about fifty in number arrived at Trafalgar Square at about three o'clock. Several thousands of people, a large proportion of whom were unemployed, from various suburbs had gathered to meet them. The meeting passed a resolution that the government receives a deputation: "with regard to purchasing land by which the working man can live by his labour". As the meeting broke up, seven men were arrested for public order offences. Pooley, chairman of the “Back to the Land” Society, was seen as a colourful character, whose “chariot”, carrying both himself and a band of musicians, became a familiar feature on “hunger demonstrations". According to the Nottingham Evening Post, of 13 January 1910, he was a "Back to the Land" candidate for South West Ham in the election of 1910. This sounds like fanciful story telling by Pooley, for there was no such candidature in the General Election in that year, for the seat held by Will Thorne. Nonetheless, the Evening Post went on to report that his election address was dominated by quotations from the scriptures, announced that: "With the abolition of the workhouse, there'll be no separation (ed: by gender in the wards) at Pooley's Happy Homes. Hallelujah!" Pooley told the paper that he planned to leave no stone unturned: "until we get the people back to the land." On the back of the "election address" were the objectives of the "Associated Garden Village", with "The whole scheme to be carried out by Pooley's Glorious Army." Later in 1910 he led another march through his home county of Norfolk with the stated intention of petitioning the king at Sandringham. The march petered out, but not before Pooley had been involved in a fracas with local farmers. Described as “thickset and robust” and dressed in a frock coat and silk hat Pooley appeared to have access to funds, which financed a number of ventures apart from the marches, including a farm colony on Canvey Island, and various institutions in east and west London to support the unemployed. A curious looking vehicle, quite unlike anything seen in ordinary road traffic, entered Norwich on Thursday (ed: see photo). .. 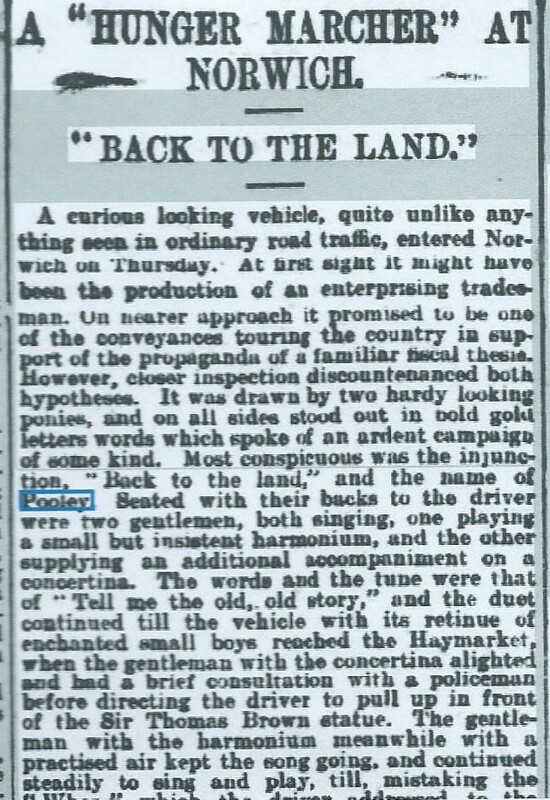 It was drawn by two hardy looking ponies, and on all sides stood out in bold letters words which spoke of an ardent campaign ... most conspicuous was the injunction: "Back to the Land" and the name of Pooley. The paper variously described Pooley as: "reputed author of The Triangle Camp Plaistow", of "The Hunger Marcher Movement", of "Pooley Farm Colony, Winter Gardens, Canvey Island", with "headquarters at Pooley's Hall, Upton Park" (ed: his house at 66 Plashet Road - see photo, today - yet more aggrandisement of the ordinary, to create effect), "with city offices and branches all over the land." Part of it is vaguely scriptural, some of it is broadly humorous, but all of it passionately advocating the simple joys of the agriculturalist. Mr Pooley makes a fine figurehead for his campaign, but his thick set, robust figure, clad in a frock coat and silk hat and the massive head and a full-grown beard hardly suggests the "hunger marcher". Pooley sang and preached "back to the land" messages, accompanied by a man on a harmonium, as the marchers stopped in different settlements on their marches, in an effort to raise funds for the families of the poor marchers. He said that there was room for 2 million men and their families, on the land - which would solve the problem of unemployment. The newspaper said that:"His literature talks of establishing a chain of self-supporting garden villages, within 50 miles of the metropolis". he described as "Pooley's Hall"
Three months later, Pooley was in court in Norfolk for non-payment of rates, for a stable in Oak Street and a shop in Golden Ball Street Norwich. Quite where he obtained the money for these properties is unclear - as he was not, despite his pretensions to the contrary, a man of wealth or substance, as details of his estate, published four years later, showed. 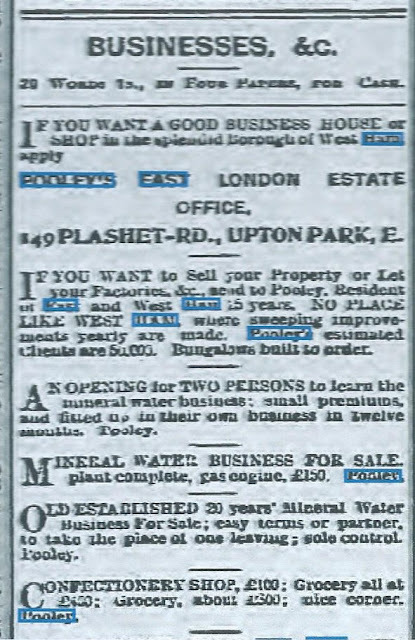 It is not clear, either, whether Pooley had, by now tired of the both the estate agency and auctioning business, as the 1911 census continued to show him as a Mineral Water Manufacturer and employer, based at 62 and 66a Plashet Road, from where he conducted his business. Later that year he was involved in a court case, in west London for altogether very different activities, which may raise an eyebrow, today, and show a very different side and priority for the man. 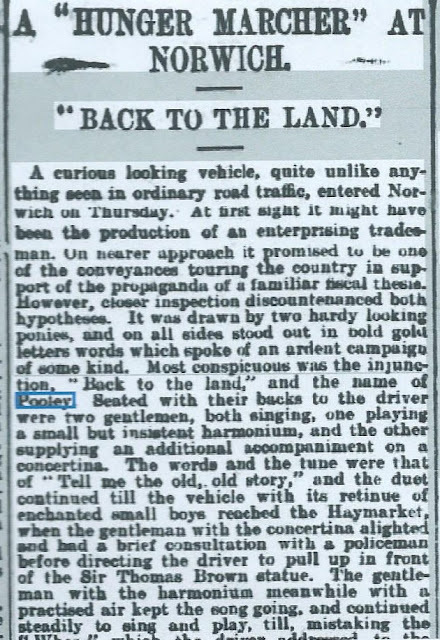 The Norfolk News of 11 November 1911 reported the strange case, where details of Pooley's life style were revealed, in passing. He was described as running "Pooley's Castle" (another exaggeration), a former police court in Brook Green, Hammersmith. Pooley, who confirmed his interest in unemployed people, was said to have used "the Castle" to house hunger marchers and was described as a non-alcoholic drinks manufacturer. Quite how, or why, he was running a "Castle" in Hammersmith is unclear, but equally unclear is why he ran what was described as "Pooley's Ark" in Fulham Cross - also in west London. It was described in court as being an "Abode of Love ... inhabited chiefly by boys and girls." This seems to have been Pooley's last significant public foray before his death two and a half years later, but his obituary in the Fulham Chronicle on 24 April 1914, penned by someone clearly unsympathetic to him paints a picture of a complex man. Part showman, part drinks manufacturer, part friend of the unemployed, part Christian - with just a hint of the charlatan about him. Pooley was a picturesque figure, with long grey beard, usually displayed himself in a frock coat, very shiny at the seams, a top hat of antique shape and a glaring pair of pepper and salt 'reach-me-downs' (ed: second hand trousers). Pooley was a mob orator of considerable ability and he combined much word philosophy with a good deal of business acumen. He was to restore Eden to earth by placing the unemployed back to the land. As an earnest of his intentions, Pooley held open-air demonstrations at Fulham Cross and Waltham Green and, incidentally, raked in a good many subscriptions towards the necessary expenses. But, the unemployed whom he gathered about his banner: "The earth is the land's and the fullness thereof" blazoned across it, never got back to the land. "Father" Pooley found them employment at very low rates in the manufacture of mineral waters and British wines. The sale of these was promoted by a door-to-door canvass, conducted by "genuine unemployed" who made the ground of the appeal to buy the fact that they received a commission on each bottle sold. The mineral water cart, with its attendant troop of canvassers, was quite a familiar spectacle in Fulham and district. It travelled far afield, too, and right down to Portsmouth. Pooley's men spread the news of his wonderful wares and his fine philosophy. There was one distinctive feature about the selling which conveys much to the intelligent reader. "Why guv'ner", he confessed with a cynical smile, "if yer were to go to an 'ouse where you'd sold a bottle before, they 'it yer over the 'ed with the empty". Volumes would not have said more. Pooley always gave an air of religious sanction to his "philosophic labours, and by much quoting of the Scripture. His favourite "Back to the Land" banner bore the text; "The earth is the Lord's and the fullness thereof", though why this fact gave Pooley and his followers any claim to it was never explained. He had a remarkable knack of getting hold of soft-headed parsons and stupid church people and securing a collection. ... Pooley, himself, sang the hymns and attended to the devotional exercises with fine fervour. He died of syncope (fainting) on 16 April 1914, in a shop in Albert Road, North Woolwich, apparently, as the press reported with some glee, "after eating a very large meal". As one headline put it, the “strange fate of a hunger marcher”. His death certificate registered his home address as 66 Plashet Road, and the sole beneficiary of his will, published six months later, was his eldest son, Herbert - who received a total of £175 (less than £20,000 in today's terms). There is barely a trace of a footnote in the various social histories of life in Edwardian Britain of William Pooley, but a man with local connections and a colourful past surely demands one. The above piece is written in the spirit of providing it! Exactly century after the Plaistow Land Grabbers occupation, a group of residents from around Abbey Road in Stratford - about a mile away from the occupation site - took a much more legitimate route to secure a similar plot of land for local use, and established Abbey Gardens. Working with Newham Council, they established a community garden there. In doing so, they have helped create a memorial to the Plaistow Land Grabbers. Like the Plaistow land, this ground was largely unused at the time of the creation of the gardens. 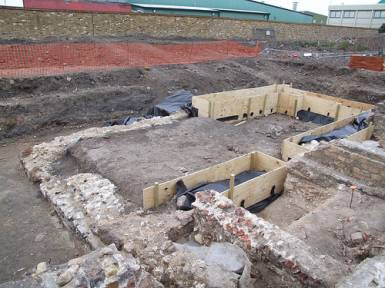 There is within it, however, a small patch of land of archaeological interest. It has been surveyed and excavated twice by the Museum of London and declared to be the site of the entrance to gatehouse to the 12th century Cistercian Stratford Langthorne Abbey. As such, it is protected from development by English Heritage. Again, like the Plaistow plot, it is almost adjacent to a railway line - this time the DLR, and is next to the Abbey Road station. Many of those involved in the development of Abbey Gardens were inspired by the Plaistow Land Grabbers and reproduced the principal surviving photo of the group on the outside of the headquarters they established on the site. They have also inscribed the message painted on "The Triangle Hotel" on the back wall of the site - "What Will The Harvest Be?" (see photo, below). Volunteers have created 30 raised triangular growing beds - inspired by "The Triangle Camp" - in the garden and run it as a collective allotment, or community garden, similar to that in Forest Gate. No individual "owns" or "rents" any of the raised plots - they are, instead, tended collectively. There are a number of sessions each week when volunteers are encouraged to tend the plants and share the delights of the open space. Friends of Abbey Gardens are always on the look-out for volunteers and support. They often run events for local people and have started to host a local market, on Saturdays. They can be reached via their website: www.abbeygardens.org and have both a Twitter (@_AbbeyGardens) and Facebook presence (facebook.com/abbeygardens). They would be delighted to hear from you. Footnotes. Much of the contents of this article has been extrapolated from the archives of Ancestry and the archives of the British Newspaper Library. Our thanks are extended to The Friends of Abbey Gardens website (see above) for some of the images reproduced of Abbey Gardens. We wish them well.